After some exciting 4WD-driving in the Great Sandy National Park (Fraser Island and Rainbow Beach), we spent one more day in Noosa to enjoy the beaches and explore Noosa National Park. Noosa is a very cute town at the Noosa River and, of course, the Pacific Ocean. It comprises Noosa National Park, where many walking tracks are located and which is packed with beaches along the coast. Noosa is a little bit difficult to orientate as the rather small town consist of many different parts – Noosaville, Noosa Heads, Noosa North Shore and Tewantin. In addition to that, the town is mainly composed of roundabouts – very confusing. We had booked our tour to Fraser Island from Noosa, but Noosa did not exist in our GPS (it only had Noosa Heads and Noosaville) – very confusing. The tour to Fraser Island, which we had booked from Noosa started in Tewantin – that is where the Noosa Marina is located. We were completely lost until the end – when we left, we still needed a GPS to somehow navigate through the town. 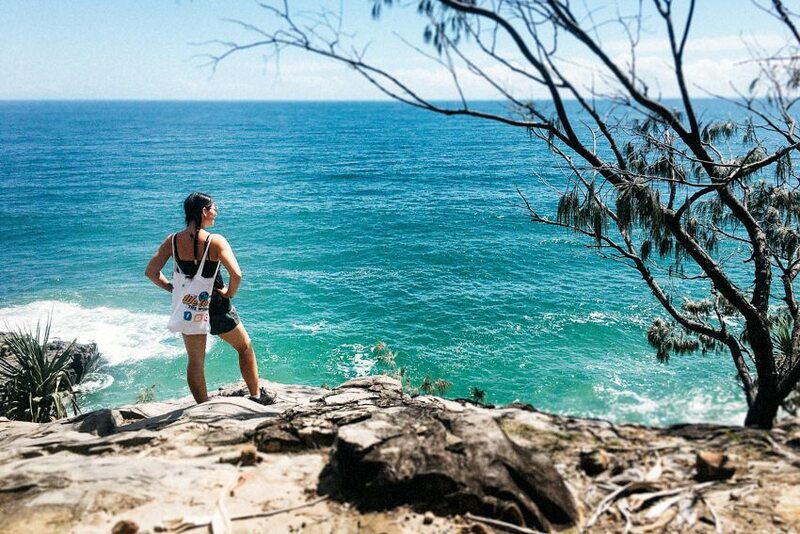 Noosa National Park is divided into four sections: Headlands (Noosa Heads), East Weyba (around Lake Weyba) as well as Emu Mountain and Peregian (north of Coolum). It is the most visited National Park in the state of Queensland. The park is home to many koalas (if you are lucky you will discover one hanging in the tree – but: it is very difficult as they are very hard to see) and the coastal sections are very popular places for whale and dolphin spotting (boat and jet ski tours are also available). 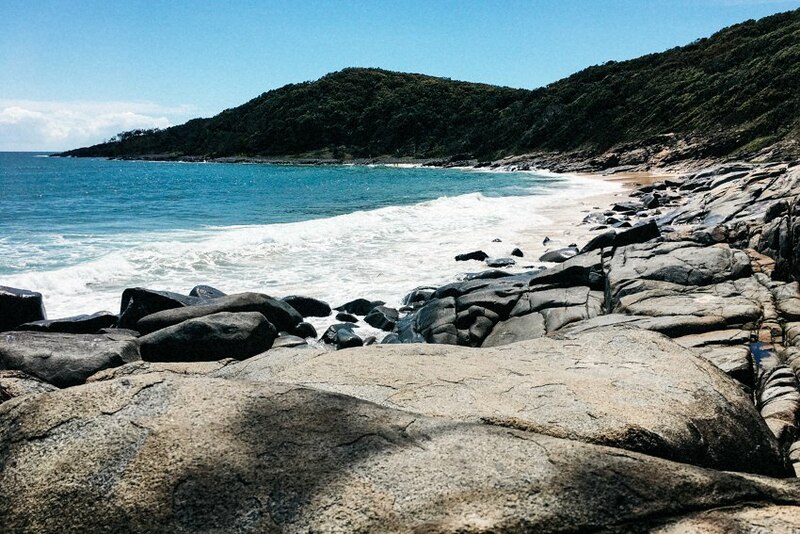 The park also has many beaches (also some inofficial nudist beaches) – some are patrolled some aren’t. We decided to explore the Headlands Section of the park for one day. The Headlands Section is located in Noosa Heads – all tracks start at the tourist information center on Park Road right after Main Beach. There is a huge car park where parking is free the entire day. We did the Coastal Walk (which is, by far, the most popular one) as it leads along the coast (the others leading through the rainforest) and offers stunning views onto the ocean and the beaches. The only circular track is the Palm Grove Walk. We decided to make the Coastal Walk a circular track as well by combining it with the Tanglewood Walk. By doing so, we avoided walking back the same way we came and we got to enjoy the beauty of the coast as well as the rainforest. For the entire loop we need about 4 hours (including picnic, bathing and picture stops). The entire coastal walk is paved and it includes some really nice viewpoints. The Tanglewood Walk is not paved – you basically walk on leaves – but the path is marked very well. Right when we entered the Coastal Walking Track, we saw a group of people looking up into a tree – we knew immediately that this was our lucky day. They had really spotted a koala and we got to enjoy our first view onto a koala in the great outdoors. They are not exceptionally active – they just sit, eat and chill all day long – but they are still really cute to watch. Then we spotted dolphins at Dolphin Point, one of the first viewpoints along the track. The most spectacular beach is Alexandria Bay – which is an extensive and pretty abandoned beach (at least it was when we were there). The last viewpoint on the Coastal Walk is Hell’s Gate – you basically stand on the cliff and look down onto Alexandria Bay. From Hell’s Gate you can walk down to the beach (about 5 minutes) – on the way to the beach you will also find the junction into the Tanglewood Walk. We went into the water at Alexandria Bay (although it is not recommended due to strong currents) although it is unpatrolled, as also many other people where in the water. We did not go swimming though, we just went into the water knee-high. The Tanglewood Walk is not very spectacular but if you have never walked through deep rainforest, it is worth doing it. For us, it was the first un-guided rainforest experience and we really enjoyed it. It was exciting because we did not know what to expect (friendly and not so friendly animals) and tranquilizing because the rainforest is a calm and uncrowded place. The only thing you hear is birds and the only thing you see is thousands of years-old huge trees. We did not see any animal we did not want to see or that did not want to be seen by us. 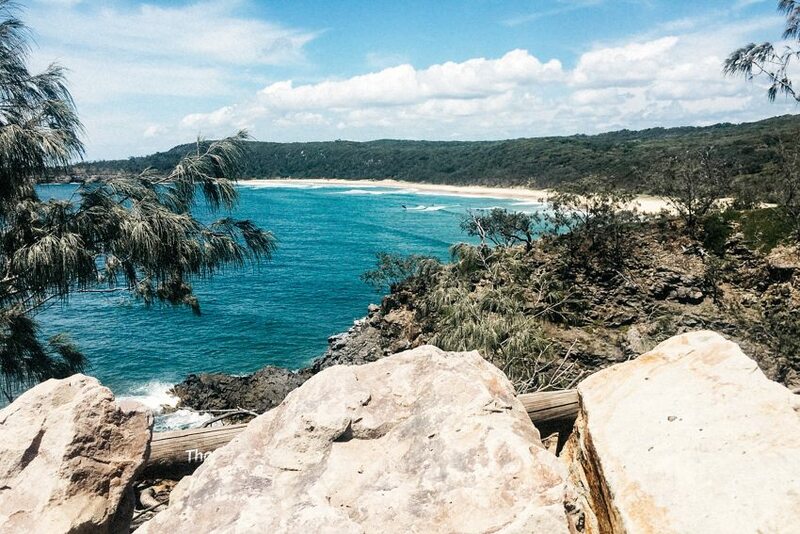 We do highly recommend to visit Noosa National Park for at least one day when visiting the area around Hervey Bay / Noosa / Fraser Island. You can easily also spend more days there – exploring also other sections of the National Park. We spent 3 nights on a free rest area on Eumundi Noosa Road (Laguna Grove). There are a few picnic tables and a playground but no toilet facilities. We are Bianca & Tom. we love our life just the way it is. Still, we know there’s gotta be more and that is what we constantly want to discover new places and we want to take you on our journey with us. The journey of our life which is a journey to ourselves … one time around the world & beyond. Copyright © 2017 - 2019 by wetourtheworld.com | All rights reserved.